Updated: 5:40 p.m. | Posted: 3:57 p.m.
A Minneapolis FBI agent who started his career with the agency as an intern in 2000 has been charged with leaking classified information to the news website The Intercept. Terry James Albury's attorneys, JaneAnne Murray and Joshua Dratel, said in a statement that their client, the only African-American FBI field agent in Minnesota, was "driven by a conscientious commitment to long-term national security and addressing the well-documented systemic biases within the FBI." "Terry Albury served the U.S. with distinction both here at home and abroad in Iraq," the statement read. "He accepts full responsibility for the conduct set forth in the Information." Albury, who was assigned as Minneapolis-St. Paul International Airport liaison working on counterterrorism matters, was charged this week by the Justice Department's National Security Division with one count of "knowingly and willfully" transmitting documents and information relating to national defense to a reporter for a national news organization. Albury was also charged with a second count of refusing to hand over documents to the government. Albury is the second person charged with leaking secret documents to The Intercept. In June 2017, an intelligence contractor was charged with leaking a classified report about Russia's interference in the 2016 election to The Intercept, the first criminal leak under President Trump. The Intercept does not discuss anonymous sources, editor-in-chief Betsy Reed said in a statement posted on their website. The Justice Department has vowed to crack down on leaks that it contends undermine national security. A request for a search warrant filed in Minneapolis federal court against Albury did not identify the news outlet, but a review by MPR News found the documents described in the search warrant that Albury leaked exactly match the trove of FBI documents posted by The Intercept. 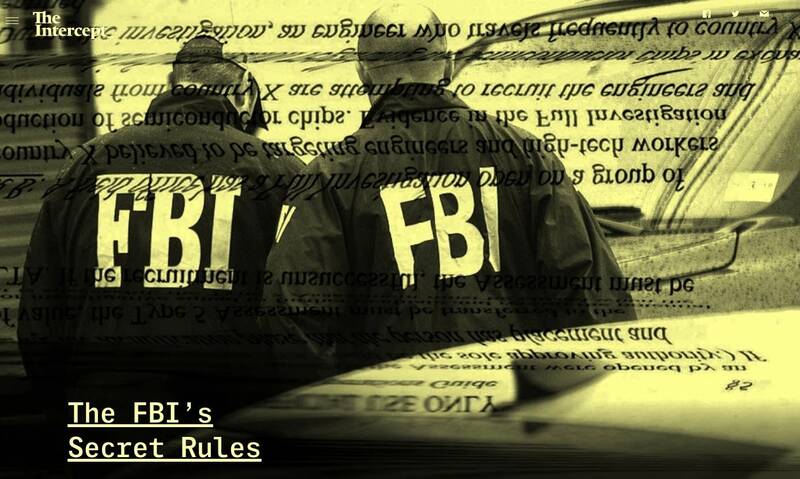 In January 2017, The Intercept published a series titled "The FBI's Secret Rules," based on Albury's leaked documents, which show the depth and broad powers of the FBI expansion since 9/11 and its recruitment efforts. The Intercept made two Freedom of Information Act (FOIA) requests to the FBI in late March 2016. The requests contained specific information identifying the names of documents that were not available to the public. In addition, the FBI identified about 27 secret documents published by The Intercept between April 2016 and February 2017. One of The Intercept's FOIA requests, dated March 29, 2016, asked for copies of a specific document classified as secret. The document, titled Confidential Human Source Assessing, gives tips for agents on how to cultivate informants. Ten months later, the news outlet posted the same document it requested to its website and to DocumentCloud, a repository of public documents. The FBI said it believes that The Intercept had a copy of the document and others before making the FOIA request. The Intercept then "used its knowledge of such documents to create the FOIA requests," according to the warrant. According to a review done by the FBI, Albury and 15 other individuals had also accessed the same document from an FBI classified network between August 2011 and March 29, 2016, the date of The Intercept's FOIA request. The search warrant said Albury took 11 screenshots of the document on Feb. 19, 2016, one month and 10 days before The Intercept's FOIA request. "To date, a review of FBI records has revealed no indication that any individual other than ALBURY both accessed this document and conducted cut and paste action," the warrant said. An FBI audit found that Albury had accessed several documents from FBI systems classified as secret that were published by The Intercept, according to the warrant. On three occasions in the summer of 2017, video surveillance captured Albury at his office at the airport, holding a digital camera and inserting what appears to be a memory card into the camera, according to the warrant. He then took photos of his computer screen which contained documents classified as secret. Albury, who was hired by the FBI in 2001, a year after finishing his internship there, to conduct surveillance operations, became an agent in 2005 and was assigned to the FBI Minneapolis Field Office. The Justice Department has not yet responded to MPR News' request for Albury's employment history at the FBI.